As an alternate form of payment to credit cards online, customers may pay for their order using their credit card, by phone or by fax. We currently accept the following currencies for orders that will be paid by credit card: US dollar (USD), Euro, British pound sterling (GBP), Australian dollar (AUD), Canadian dollar (CAD or CDN). We are currently accepting the following credit card types: Visa, Mastercard, American Express (USD only) and Discover (USD only). Phone orders are subject to an additional $3.00 USD order processing fee. Orders paid by credit card via fax are subject to an additional $3.00 USD order processing fee. number: Please enter the Serial Number or “NONE” if trial version. Invalid format. Not enough numbers. * (Click About > Info on the StampIt Main Menu) If it is unavailable, enter NONE. If you have a general question or comment, please use this form. If you have a technical support issue, please click on the Support Request tab at the top of this page. Category: Please select... Web site Company Enterprise Licensing Feature Question Partner/Alliance Services Suggestion Other * Please select a Category. My signature stamps are not working. Why does the StampIt icon not appear to the left of the HELP button in Word 2000/2/3? Using Word 2003 or 2007, why does an outline appear around a text box in the left margin of a page when using an HP printer? Using Word 2003, why do outlines appear around the letters of shaded/watermark stamps? Using Word 2000, why does an outline appear around the watermark/shaded stamps? How do I backup custom stamp and group settings if I have to reinstall StampIt? When I prewiew or print a stamped document, the stamp is hidden by a graphic or shaded table. Why? How do I create a PDF file that has a stamp on the document? Using Vista, why do I get a 1925 Error Message when attempting to install StampIt? From the StampIt main menu, Click Options > Use Signature Settings > check Save Options. When in Signature Settings, be sure and check each box of each stamp that you want associated (Text, Handwritten, Graphic,) with the particular Signature setting. Check the COPY check box. If the StampIt icon did not install on your toolbar next to the Help menu item (Word 97-2003), check your Outlook settings and uncheck the option to have Word as your default e-mail editor (see below). When the StampIt icon is showing, Word can be re-instated as your e-mail editor if desired. Click on the Mail Format tab. Make sure the Use Microsoft Office Word 2003 to edit e-mail messages checkbox is NOT selected. In versions before Outlook 2003, the text reads Use Microsoft Word to edit e-mail messages. Outlook 2007 always uses Word for editing where this is not an issue. Click on (1) Start (lower left of screen) (2) Search and (3) find the file called “StampIt.dot.” Copy that file to your Startup Directory in Word (Tools>Options>File Locations), highlight the “startup” directory and click “Modify” and then the drop down arrow to display the full path. This issue is isolated with random HP printers using PDL/PCL 5/6 language with Word 2003. Microsoft owns this issue and it does occur periodically in Word 2007. Two solutions are available: (1) Change your printer driver to a Post Script driver; or (2) change the text box "FILL: COLOR" to NO FILL. The default is white and cannot be reset in Word. Changing the FILL COLOR to NO FILL is usually changed in a document template where the text box is inside the header or footer. To make the change, right-click on the text box inside the header/footer > click Format Text Box, > click the drop-down box for FILL: Color and select NO FILL. NOTE: If your document is based on a template, making the above changes to your document template will make the fix permanent with subsequent documents based on that template until reset. Changes made in a document are only good for that document and do not transfer to the "Normal.dot." There are certain random series of HP printers that have issues with printing watermarks in PDL 5/6 language. HP and Microsoft do not have a solution for this anomaly yet. If this happens with your printer, usually installing and/or switching to a Post Script printer driver for the same printer solves the problem. According to HP, Microsoft owns the issue and indicates a future version of Office Word will have the fix. 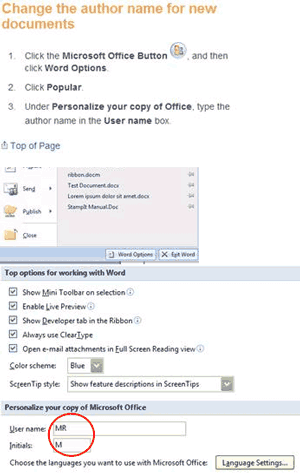 Office 2007 appears to have resolved the problem in Word 2007. There are certain random series of HP printers that have issues with printing watermarks in PDL 5/6 language. HP and Microsoft do not have a solution for this anomaly yet in Word 2000. If this happens with your printer, usually installing and/or switching to a Post Script printer driver for the same printer solves the problem. According to HP, Microsoft owns the issue and indicates a future version of Office will have the fix. Office 2007 appears to have resolved the problem in Word 2007 and we have adjusted for it in Word 2003. The stamp changes and Groups are saved in the C:\Program Files\StampIt\Stamps directory. Users can backup this directory or copy stamps from this directory to other PCs. In Vista, the stamp changes and Groups are in the \AppData\Roaming\Enhancement Software\StampIt\Stamps folder. There is a STAMPS.TXT and GROUPS.LST file that also must be copied with the stamps. If ALL stamps are NOT copied to another computer, the STAMPS.TXT file has to be manually modified on the target computer if the custom stamp(s) did not already exist on the target computer. Use Notepad. This is a limitation of Word of displaying a graphic in a header. To workaround this, change your StampIt settings to "Stamp Every Page." Start StampIt, click Options > click the radio button in the top section of the dialog (Stamp Every Page). The default is "Let StampIt Decide." This setting will stay until you change it. For large documents, this method of marking takes more time to process as StampIt is analyzing each page. Another is to have StampIt leave the stamp in the document. To do this from within StampIt: Click Options > select " Leave Stamp in Document." > OK. Then you can either print your document or select "None" from the "Pages to Print" drop-down box in the StampIt main menu. Click StampIt. The selected stamp will be left in your document. UAC (User Account Control) in Vista wants you to install according to its protocol. Right click on the file and click on "Run as Adminstrator." When asked to confirm, do so. Using Word 2007, why do I get a "4120 Parameter Error" when clicking the StampIt Menu Icon? We collect personally identifiable information, like names, postal addresses, email addresses, etc., when voluntarily submitted by our visitors or customers licensing our products. The information you provide is used to fulfill your specific request. This information is only used to fulfill your specific request, unless you give us permission to use it in another manner, for example to add you to one of our mailing lists. The Site may use cookie and tracking technology depending on the features offered. Cookie and tracking technology are useful for gathering information such as browser type and operating system, tracking the number of visitors to the Site, and understanding how visitors use the Site.Cookies can also help customize the Site for visitors. Personal information cannot be collected via cookies and other tracking technology, however, if you previously provided personally identifiable information, cookies may be tied to such information. Aggregate cookie and tracking information may be shared with third parties. The free trialware version of StampIt is limited to 15 uses or 15 days from the date of installation, whichever occurs first. It is fully functional. Use the trial before you purchase to ensure the program will be compatible with your needs and satisify your requirements. However, you can get your registration key at any time through the StampIt Ordering link above. In addition to the free trial, ESC offers a 30-Day Money-Back Guarantee for purchases of up to three (3) licenses, each a different location. If for any reason you are not completely satisfied with the product you purchased from us or it just does not meet your expectations, you should notify us within 30 days from the date of the purchase and we will process the refund. This refund option is for new users only and does not apply to successive or additional licenses if StampIt has been previously licensed. • Review the FAQ database (link above) or our online manual. You might be able to find an answer that helps you better use the product to your satisfaction. • Visit our Forum. Perhaps others have been in the same situation and you might find a solution there that works for you as well. Moreover, our support team provides answers to many forum questions. • Contact our support team to see if there is anything further we can do or try. Our support team does its best to solve any issue or to provide a fast fix to a problem. If the above solutions do not work for you and you want a refund, simply contact support via "support request" link on the left side of this page within 30 days of your purchase, provide the Order ID number from your receipt and we will process a refund. When requesting a refund, please indicate the reason you wish to stop using our product and service, and if there is anything we can do to keep your business. If there are any questions prior to licensing, please contact us for an answer. Enhancement Software ("ESC") is privately held, based out of Los Angeles, CA and has been in providing office efficiency solutions since 1993. ESC helps both large and small businesses with automation of their document marking and protection requirements together with custom office automation add-ins for Microsoft Office Word. As a member of the Microsoft Partner Program, Enhancement Software has been providing solutions to and customized applications for the legal and business industries since 1993. ESC's flagship add-in, StampIt, broadened the universe of ESC to virtually every type of entity from pizza parlors to the Pentagon. StampIt was originally created for WordPerfect 5.1 and has evolved to be exclusively for Microsoft Word. With StampIt, users have the ability to not only automate the paper and PDF document marking process, but completely tailor it to their particular requirements. This includes document marking that virtually precludes paper or PDF use in an unintended manner. ESC has associates in Washington state and Toronto, Canada focusing on paper and PDF content security and process automation. ESC also provides custom process automation services.